are involved with the program. Of the 650 hampers distributed every Christmas, close to 300 come from local schools. Individuals, churches, businesses, service clubs and community groups sponsor the rest. The Salvation Army has a similar hamper program and distributes an additional 750-plus hampers to families in our community. ‘This is not going to work, no one will be there.’ Who would want to go walking on a morning like this? Much to my surprise, lots of people—18 women, in fact—showed up for the “Four Bridges’ walk that morning and were now gathering at the Comox Quality Foods restaurant for a well deserved warm beverage. The Comox Valley Newcomer’s Club is a social group for women who have moved to the Comox Valley within the past two years. “We help to make women who are new to the Valley feel comfortable, meet friends and learn as much about the Valley as they can,” says ex-Ottawa native and current Newcomer’s Club president, Julie Tuepah. The club currently has 156 members, which makes it the second largest in Canada. The Calgary club is the largest and also the oldest as it celebrates its 50th anniversary this year. Club composition varies from city to city. 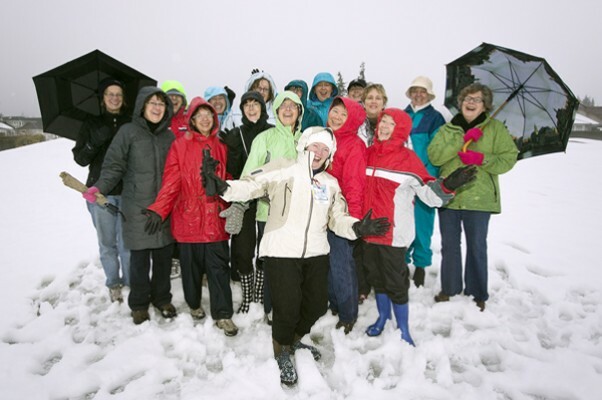 The Comox Valley club is a women’s only organization, but male partners and spouses are able to attend about a third of the club’s many activities. The club executive organizes the monthly meetings at the Florence Filberg Centre where people can join the club, promote an activity and hear a presentation about the Comox Valley from a guest speaker. The January speaker was Ian Kennedy who gave an overview of his book, The Life and Times of Joseph McPhee. When Francis moved here from Calgary four and a half years ago she heard about the Newcomer’s Club but was not predisposed to join. “When I came here someone said I should join Newcomer’s and I had this vision of Newcomer’s being a bunch of old women who didn’t do anything and I fought against it. Then one person said, ‘No Judy, you are completely wrong—it is the opposite, give it a try.’ Well, obviously, I did.” She jumped right in and has held many positions including president of the Comox Valley Club, liaison to National Council, and last year, national president. The National Council assists the 60 clubs and approximately 6,000 members across Canada. The Comox Valley is gaining population and thus the club is growing and vibrant. As national president, Francis worked with many clubs that were shrinking due to economic factors and out-migration. Given her initial reluctance and now her broad perspective, I asked Judy what she tells people to entice them to try out Newcomer’s. “I ask them to give it a try. It’s not for everybody. But generally once they come on one of the Friday morning walks, which I encourage, and come for coffee afterwards, they’re pretty much smitten. Because the women are wonderful, and there’s somebody here that they’re going to relate to probably and then they’ll start meeting more people and it just grows. The Alumni walking group has joined us for coffee because their Friday morning walking group had coincidentally been out on the same route. Prior to writing this article I believed that the Newcomer’s Club was just for retired people who could go for walks and coffee mid day, mid week. That is not the case—to serve the younger new residents there is the Betwixt & Betweeners group. It is open to newcomers who are age 55 and under and their spouses and partners, with activities planned for evenings and weekends. The club is not just inwardly focused on the needs of its members. The Newcomer’s Club actively participates in the community, donating to the Coast Realty Christmas hamper program and through an annual targeted fundraising project. This year the club is raising funds for the Comox Valley Transition Society. For the last three years they have received the Spirit Award from the Vancouver Island Heart & Stroke Foundation for the club’s efforts in the Big Bike Ride fundraiser. Club vice-president Bev White credits Newcomer’s for her involvement in other community fundraising projects. White, along with many other members, is helping with the upcoming musical Have a Heart, which runs at the Florence Filberg Centre from February 11-13. The production will raise funds for the Central & Northern Vancouver Island United Way, St. Joseph’s General Hospital Foundation and the Comox United Church. The musical is being directed by Gloria Herauf, an accomplished theatre director from Saskatchewan, who is a member of the Comox Valley Newcomer’s Alumni.